The large changes in water levels on Georgian Bay and Lake Huron have been painfully obvious to both residents and visitors alike in recent decades. The Bay has just experienced its longest stretch of low water levels, which lasted from 1999 to January 2013. During this time levels measured below the all-time historic low previously set in 1964, and were 70 cm below the long-term seasonal average. They were also 194 cm lower than the all-time highs reached in 1986, part of a long period of high water levels lasting from 1971 to 1989. Sustained extremes in water levels can cause a lot of damage, both on the environmental/ ecosystem side of things, and on the human and urban infrastructure side. Sustained low water levels for example can exacerbate water quality degradation, especially if it is already compromised. 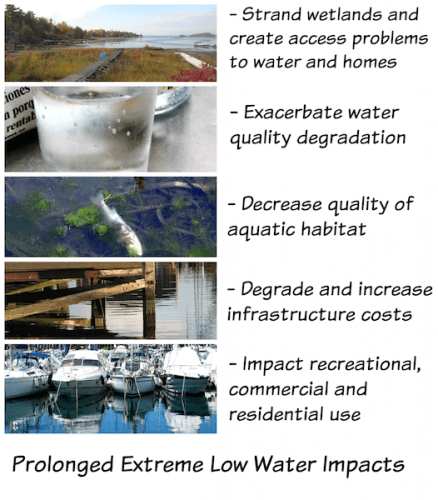 Low water levels can accelerate the degradation and/or destruction of aquatic habitat conditions. They can also strand wetlands and put numerous species at risk, especially those that were already endangered. For humans, they can imperil the quality of the water used as a drinking water source, as well as impact residential, recreational and commercial/industrial uses and inputs for generations to come. Further, they can undercut or degrade coastal infrastructure, much of which was built on wooden cribs that rot once exposed to the air. 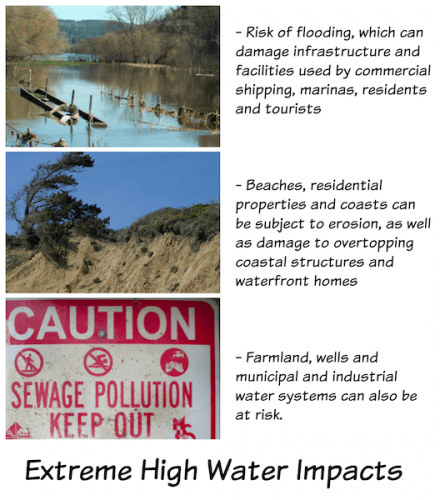 Similarly, sustained extremes in high water levels can result in flooding, which can damage infrastructure and facilities used by commercial shipping, marinas, residents and tourists, including piers, boat launches, parking lots, bridges and roads. Farmland, wells and municipal and industrial water systems can also be at risk. Beaches, residential properties and coasts can be subject to erosion, as well as damage to overtopping coastal structures and waterfront homes. The risk of downstream flooding and damage also exists.